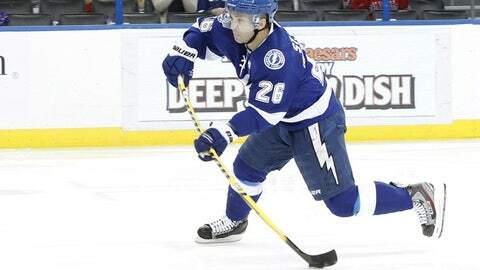 Martin St. Louis has goals in three straight games for the Tampa Bay Lightning. TIME: Saturday at 7 p.m. The Tampa Bay Lightning return from the NHL’s holiday break chasing their longest winning streak since the 2010-11 season — the last time they made the playoffs. They’ll try to get it done Saturday night at home against a Montreal Canadiens team out to catch them in the Atlantic Division. Tampa Bay’s streak reached a season-best five wins with a 6-1 victory Monday at Florida, moving two points ahead of Montreal for second place in the Atlantic and third in the Eastern Conference. The Lightning haven’t had a longer regular-season run since winning six straight Jan. 18-Feb. 1, 2011, though they also won eight in a row a few months later in the playoffs. Martin St. Louis has a point in each victory during this streak and had a goal for the third straight game Monday, when he also had two assists. Tampa Bay is 12-0-1 when he scores. Valtteri Filppula also has a five-game point streak with three multipoint games in the last four, including a power-play goal and an assist Monday. Having allowed seven goals in five games, Tampa Bay (23-11-3) continues to find ways to be effective while Steven Stamkos recovers from a broken leg. Bishop made 28 saves to become the league’s second goaltender to reach 20 wins. He’d never had more than 11 in four previous NHL seasons. The first-year starter is riding his own 5-0-0 stretch, posting a 1.16 goals-against average, and he’s allowed more than two goals once in his last 11 starts. Bishop is 3-1-1 in six career games against Montreal with a 1.81 GAA. The Canadiens (22-13-3) will have gone a week between games when they take the ice in Tampa to continue a season-high six-game road stretch. They blew a 3-0 first-period lead Saturday in Nashville, but David Desharnais scored in overtime after forcing a takeaway to send the Canadiens into the break with a 4-3 win. Desharnis and Max Pacioretty each have four points in the last three games. Canadiens goalie Carey Price hasn’t been particularly sharp on the team’s 1-1-0 start to the road stretch, yielding eight goals with an .873 save percentage. Defenseman Josh Georges missed the Nashville game because of a lower-body injury, and his status against the Lightning is uncertain. Tampa Bay blue-liner Sami Salo left in the second period against Florida with an upper-body injury, though it’s not believed to be serious. The Canadiens suffered a 2-1 shootout loss to the Lightning on Nov. 12 at Montreal in the teams’ only meeting this season after winning the previous four. Filppula had the only shootout goal but has no points in six career matchups with the Canadiens. St. Louis has no goals in his last 10 against them.